The massacres were carried out by three teams of coordinated attackers, including a terrorist who traveled to France from Syria, along with tens of thousands of other migrants, according to chief French prosecutor François Molins. Although there were no reports of Jewish fatalities as of Saturday evening, France’s Jews remained on high alert throughout the Sabbath and afterward. For the first time since World War II, the borders of France were entirely closed. In Paris, residents were asked to stay indoors, and police issued warnings to worshippers who gathered in synagogues for Sabbath morning prayers. Why the focus on Jewish victims? One of his guests went out to see what was happening and returned to report that the streets were closed off. Police told him that there were terrorist attacks taking place around the city, and that everyone should stay in their homes. One of the scenes of the attacks—the Bataclan Theatre—was Jewish-owned until very recently, and had been the target of well-publicized anti-Israel and anti-Semitic protests and threats. Dozens of people were killed there on Friday night. Other attacks took place at Stade de France during a soccer match between French and German teams, and at a number of popular restaurants nearby. “I went out as usual to the synagogue on Saturday morning and saw that the street was closed off by police. It turned out that one of the attacks took place right near the synagogue where I serve as rabbi,” said Cohen. Rallies and expressions of personal support around the world came almost immediately after news of the terror attacks. 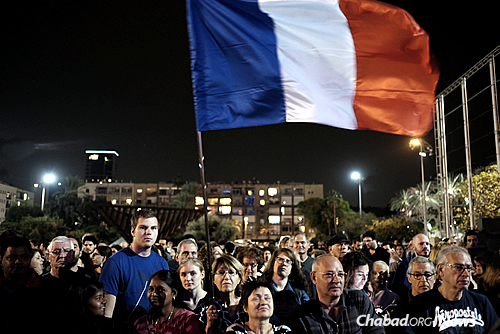 On Saturday night, Tel Aviv’s Rabin Square was filled with hundreds of Israelis—many originally from France—and a number of rabbinic leaders who expressed their solidarity, support and prayers for those killed and injured, and for the French people as a whole. Similar rallies were being prepared in Jewish communities near and far. The attacks were the first major acts of terrorism in France since the takeover of the Hyper Cacher kosher supermarket in Paris on Jan. 9 that resulted in the killing of four Jewish men, following the massacre two days earlier at the offices of the Charlie Hebdo magazine, also in Paris. This story was written and published from Jerusalem following the close of the Jewish Sabbath.